Also included is a decision matrix for how to set the policy. BYOD blocked and your company is losing productivity associated with an employee making use of a BYOD or your company is paying for each employees access device. BYOD are already accessing your corporate network, with or without your knowledge, and you are not doing anything to ensure that this is being done securely and is not in compliance with mandated federal, state, local, and industry requirements. What are the legal implication of BYOD - What is the impact of the Stored Communication Act - Record Retention and Destruction? What happens to the data and audit trail on a BYOD when an employee leaves the company? What about a lost or stolen BYOD? How is the BYOD configured to receive and transmit corporate data? What kind of passwords are acceptable to use on a BYOD? What kind of encryption standards are acceptable for BYOD? What types of BYOD are allowed and what types are not? What about jail broken, rooted or compromised BYOD? The BYOD Policy applies to any BYOD, hardware and related software, that could be used to access enterprise resources when the equipment is not approved, owned, or supplied by ENTERPRISE. A growing number of enterprise employees using BYOD - ranging from ad hoc work from home due to temporary family situations to full-time tele-work/home work arrangements. In fact, a recent survey found that 23% of enterprises (companies with 1,000 or more employees) responded that a significant portion of employees spend 20% or more of their working time working away from the office. More enterprises support regular telecommuting. On average, 17% of employees at North American enterprises report having employees who spend at least 20% of their work time away from their normal work desk or work from home. This compares with an average of 14% of employees at the European enterprises. European employers are more conservative than others about use of BYOD. Size doesn't play a big role in an enterprise's decision to support BYOD. At companies with between 1,000 and 4,999 employees surveyed, an average of 16% of employees telecommuter one or more days per week, compared with an average of 14% of employees at firms with between 5,000 and 19,999 employees, and an average of 18% of those working for organizations with 20,000 or more employees. Firms with regular telecommuters have even more frequent travelers. 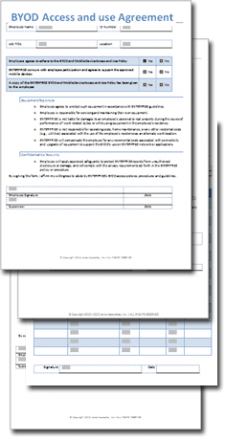 BYOD Policy Template - It is 23 pages in length. It contains everything that an enterprise needs to implement a functioning and compliant mobile device and use process. Included are forms defining the mobile device environment. As the traditional enterprise boundaries begin to fade, it is paramount that BYOD and the sensitive information they contain be managed and protected. As a result, security perimeters must also expand beyond the internal network to these numerous critical endpoints. Management within organizations becomes more complex and important as both the number of BYOD and the amount of sensitive data stored on the BYOD increases. A lost or stolen BYOD may compromise the critical data stored on it, unless there are processes and tools in place to protect it. How will you identify the BYOD assets? What are the related assets to this mobile device, for example, additional memory cards? How do you identify the asset owner and the business purpose of each device?